Amid the controversy generated by the recent murder of a journalist in Veracruz and criticism against its governor Javier Duarte, the state leader published tweets linking Josele Márquez, alias 'El Chichi', with the killing and insisted that organized crime is the real enemy of the press. Márquez, accused of being the head of Los Zetas criminal organization in Veracruz, was arrested on Feb. 2. Six days later, journalist Anabel Flores Salazar was abducted from her home in Veracruz by a group of armed men; her body was found on Feb. 9 in the nearby state of Puebla. On Feb. 13, Duarte, governor of Veracruz, said via his Twitter account that Márquez was sent to a federal prison. Then, Duarte published tweets linking Márquez to the masterminding of Flores Salazar’s murder and also an attack against newspaper El Buen Tono in Veracruz. Yet, it is unclear whether Márquez has been formally charged with the crime against the journalist or if it is linked to his transfer to federal prison. A Josele Márquez (a) El Chichi se le atribuye también el ataque al medio de comunicación "El Buen Tono" en Córdoba, Ver. Duarte also tweeted a screenshot of a Facebook post about succession plans for Los Zetas that he said Flores Salazar wrote following Márquez’s capture. The author’s name, however, was not Anabel Flores Salazar; Duarte said she had used a pseudonym. Flores Salazar covered the police beat for the newspaper El Sol de Orizaba in Veracruz and contributed to other media. She was mother to a 4-year-old boy and a baby. A few hours after learning of her kidnapping, the prosecutor in Veracruz issued a statement in which he linked Flores Salazar to a suspected member of a criminal organization and said that "all lines of investigation will be exhausted," including this relationship. The link mentioned has to do with the August 2014 arrest of a man suspected of being part of a criminal organization. Flores Salazar was in the restaurant at the time of the arrest. According to sources of Article 19, the journalist was there by coincidence and had started to document the arrest. Soldiers in charge of the arrest erased the photos, Article 19 said. The murder of the journalist generated outrage both nationally and internationally. Organizations rejected both increased violence against journalists and the criminalization of journalists by the authorities. Organizations like UNESCO, the Special Rapporteur for Freedom of Expression of the Inter-American Commission on Human Rights, the Committee to Protect Journalists (CPJ), the European Union, UN Women, Article 19, among others, have spoken about the case. Carlos Lauría, director and senior coordinator of the Americas program at CPJ, said in a column published on Univision’s website that the governor of Veracruz should resign. Duarte is a very controversial figure. According to CPJ, during his government, which began in 2010, at least 12 journalists have been killed for reasons related to their profession and three are missing. 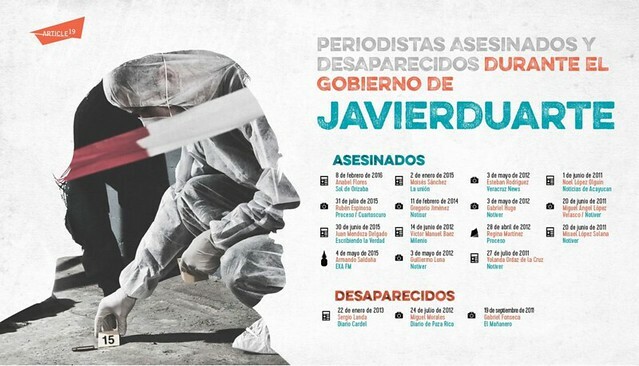 According to Article 19’s records, 15 journalists have been killed during Duarte’s administration. The administration has accused journalists of collaborating with criminal groups, “citing unverified, circumstantial evidence,” Lauría said. Also, Duarte has been accused of corruption and of having links to criminal groups. On other occasions, Duarte has denied these accusations, and in a series of tweets published over the weekend, defended himself against criticism, but also said that organized crime is the biggest threat to journalism. Salvo el caso de Regina Martínez, los demás casos donde han sido asesinados periodistas en #Veracruz, han sido por el crimen organizado. No obstante el desgaste político, mediático, físico y moral, no cederé ni un milímetro en la lucha frontal contra el crimen organizado.